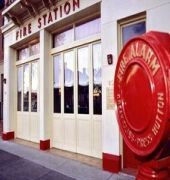 The fabulous Fire Station Inn situated in the heart of North Adelaide with its huge selection of open air Cafes, restaurants and Hotels is a luxurious boutique style accommodation of three suites. The FIRE ENGINE SUITE an open plan, richly decorated room with a fire station theme, including a real fire engine and fireman's pole. THE RESIDENCY PENTHOUSE has a private balcony, while the second bedroom opens onto the sundeck. 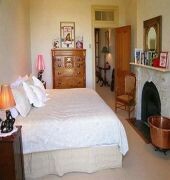 It is also known to be one of Adelaides luxurious suites with the whole top floor with great views. The LOGGIA LUXURY SPA SUITE is known to be for couples who are wanting romance and privacy. There's a luxurious two-person spa bath with marble tiles and atmospheric lighting. The suite also features a private Tuscan style courtyard.